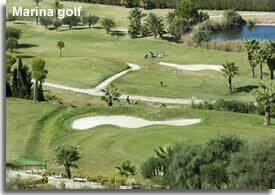 The golf courses of Almeria are characterised by the magnificent surroundings in which they are set, whether inland or coastal their locations are distinct and individual. Offering the highest quality accommodation from luxury apartments to bespoke villas, tasteful golf homes are designed around the courses and their facilities, providing a golfers dream for year round living or a golfing holiday. There are eight quality golf courses in Almeria, each offering a different challenge, understandably they attract both amateur and professional golfers from all over the world. The fabulous year round climate, and opportunities for further exploration of the region are the icing on the cake. Golfing facilities vary from club to club, driving ranges and putting greens, buggy and trolley hire, dressing rooms, lockers and showers, club storage, hotels, apartments, pro shops, restaurants... many have their own teaching schools for group or individual tuition and no club would be without the infamous last hole, the Club House. Green fees are charged per round and per person, prices can vary depending on the season and several of the clubs offer discount incentives. 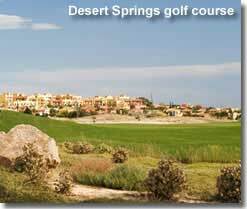 An exclusive golfing destination for golf holidays in year round Spanish sunshine. For short breaks and holidays, Almeria offers elite golf resorts, quality courses, luxury accommodation... and the most amazing settings for each of the golf clubs. 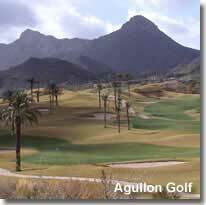 With the exception of Aguilon Golf all the golf club websites offer hotel and or accommodation bookings. 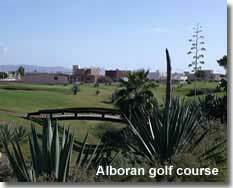 Book golf in Almeria Green reservations, accommodation, holidays. Lush vegetation surrounds the lakes and bunkers of this extensive golf resort, its testing 18 hole master course, with a par of 72, was extended in 2005 with a further 9 hole classic course. The club provides a generous practice area consisting of a chipping green with 3 exercise holes, and a putting green with 9 exercise holes. Situated within a comprehensive coastal urban development, with its own marina, in the El Ejido region of the province, Almerimar Golf Club is ideally located close to the Hotel Almerimar, the sandy beaches and the Mediterranean sea. East of the resort is the considerable nature reserve of Punta Entinas-Sabinar which extends across the headland to Roquetas de Mar, an area protected for its ecological values, flora and fauna. 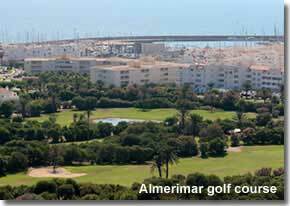 Almerimar Golf Club website, available in English, also provides further details of the Almerimar resort with options for hotel bookings. The 18 hole course has small sloping greens with shrewdly placed bunkers and water obstacles, having a par of 72, precision and skill are required, the coastal breeze bringing an added challenge to the fairway. 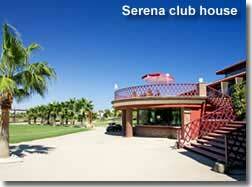 The Club House offers sweeping vistas of the Mediterranean sea and to the distant Sierra Nevada mountains. Playa Serena is the white sandy beach that forms the shoreline of the southern most area of the tourist resort of Roquetas de Mar where the golf club is situated. An urbanised area of both residential properties and holiday homes, in the immediate vicinity are the busy town centre and the port of Roquetas and to the south of the resort the protected Cerrillos wetlands, a favoured destination for bird watching. 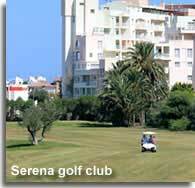 Golf Playa Serena website, available in English. Located in the foothills of the Sierra Gador mountain range, yet within a short drive to all the attractions of Almeria city, La Envia Golf Club lies in a beautifully landscaped valley amid an arid desert like setting. The mountains to the west provide protection from the wind creating optimum conditions for the course. The 18 holes, with a par of 70, have been designed to offer diversity, the earlier part of the course presents some even and long fairways, building up to holes where a special dexterity and ability is required by the golfer. There are four pratice greens offering opportunities to improve particular skills. 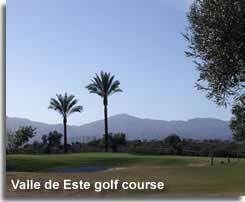 The Club is only 20m from the Hotel Envia Wellness & Golf. The city centre of Almeria is a twenty minute drive from the golf resort, and the Poniente beaches, the closest being Aguadulce in Roquetas de Mar, a mere fifteen minute drive. 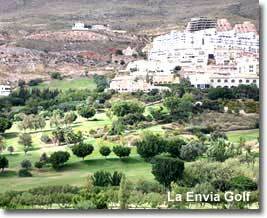 La Envia Golf website, available in English, with information and booking options for Hotel Envia. The Club has a challenging 18 hole par 72 championship course with sea views, created with emphasis on the balance between length and orientation of the holes and the locations of bunkers, streams and lakes. The generous practice range offers different training areas including a chipping green and two putting greens. Located within the coastal urbanised area of El Toyo, alongside the neighbouring beach resort of Retamar, the Mediterranean sea is just a stones throw away. 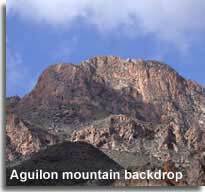 To the south Almeria city is in close proximity and even closer in the opposite direction is the renowned Cabo de Gata Natural Park. 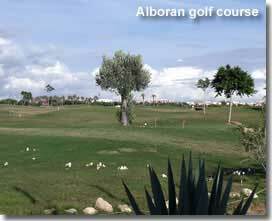 Alboran Golf website, available in English. Situated directly across from a wide sandy beach at the northern end of Mojacar Playa in the urbanisation Marina de la Torre residential zone, close to a number of hotels and to the town and port of Garrucha. The location of the golf club provides an ideal base to enjoy the beach resort of Mojacar along with the culture and gastronomy of its whitewashed hillside pueblo. The 18 hole, par 71, course is split into two section of 9 holes each. 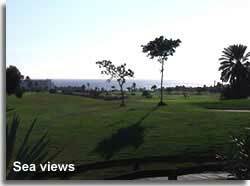 The first area is overlooking the sea, offering sensational views from the greens. The second, situated behind a small hill, provides a garden setting protected from the sea breeze. 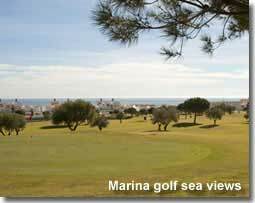 Marina Golf website, available in Spanish. A residential and leisure project with environmentally friendly values, the resort includes a 4-star hotel, golf club, spa facilities, a sports club, swimming pools, a nature trail, and a shopping mall. Situated in the heart of Vera countryside, the perfectly integrated modern homes, including villas, townhouses and apartments, are situated between fairways on the 18 hole golf course. The carefully maintained course has wide fairways, elevated tees, and receptive greens that offer a range of flag positions, the strategically placed water hazards and bunkers are designed to demand different skills from each hole. The indulgent setting, with occasional glimpses of the Mediterranean sea, provides an idyllic hideaway for the game of golf. 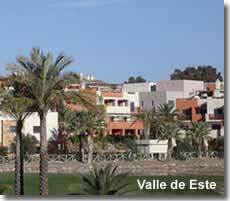 Valle del Este Golf & Spa Resort website, available in English. The visually stunning Indiana golf course in the Desert Springs Resort of the Almanzora region of Almeria was created with the top quality desert courses of Arizona and California in mind. An arid landscape of cactus and rock, beautified with local plant species, contrasts against the opulence of the green golf oasis, the 72 par international championship course offers a quality and relaxing golfing experience that be can enjoyed by players of all abilities. The resort, set amid a rugged landscape of desert plains, is surrounded by fertile valleys and huge mountain ranges, the welcoming and uncrowded beaches of Vera Playa and Villaricos are just a twenty minute drive away. 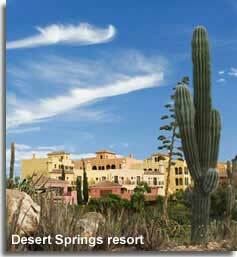 The Almanzora captures the essence of outdoor living, a warm dry climate, invigorating clean air and superb scenery. A dream Spanish location with first class resort facilities, besides its golf club, Desert Springs boasts an indoor and open air fitness centre, a day spa and three different restaurants. The resorts Crocodile Club is a family area with swimming pools, a jacuzzi, sun lawns, and imaginative play bunkers for children. The variety of luxury holiday accommodation at Desert Springs includes colonial style apartments and townhouses, individual cottages and country villas. These distinguished properties, also available for sale, would make a superb home for holidays or permanent living, and offer an excellent investment opportunity for the discerning purchaser in an exclusive complex and unparalleled location. 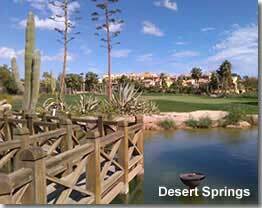 Desert Springs website, available in English, with further details of the golfing resort including holiday properties and properties for sale. Located fifteen minutes drive inland from the beach resort of San Juan de los Terreros in the municipality of Pulpi in Almeria, the spectacular 18 hole par 70 course is set against the backdrop of the Aguilon mountains with amazing views down to the coast. The course design, challenging for players at every level, is quite distinct, there are over one hundred bunkers, six lakes and several natural ravines to negotiate, granting the golfer a most rewarding game in a unique setting. Aguilon Golf website, available in English. Golf breaks, golfing holidays, reservations, special offers on green fees... visit the click2mojacar website to book golf in Almeria Spain.